Funny story about All Grown Up by Jami Attenberg. I first came across it on Twitter, when a blogger had tweeted out the jacket with their review, and I was particularly taken with the jacket quote on the front, from Hadley Freeman. It simply stated ‘I’ve read about being a single woman.’ It truly delighted me, even when I (eventually) realised that Twitter had cut off the top of the jacket and the quote actually read ‘One of the smartest and truest novels I’ve read about being a single woman.’ Oh well. Certainly a way to get a girl’s attention. There’s an excellent chapter in All Grown Up, very early on, in which the narrator Andrea talks about ‘a book’, that everyone she knows is determined that she read. ‘It is’, she notes wryly, ‘a book about being single, written by an extremely attractive woman who is now married… I have no interest in reading this book. I am already single. I have been single a long time. There is nothing this book can teach me about being single that I don’t already know.’ It’s a very dry and brilliantly funny chapter – but also I think, a deliberately well-placed one, as I was this close to recommending All Grown Up to a family friend in her 40s who is single, and now, I think I’ll hold off, or at least try and think of a more subtle way of pushing it in front of her. I suspect – hope! – I am not alone in this. But either way, this chapter in some ways sets us up brilliantly for All Grown Up – a clever, funny, compelling book about being single and childless on the verge of forty, whilst all your friends are settling down. But even as she’s advised from all sides to ‘find someone and settle down,’ not only do very few suitable partners present themselves, but not many of her happily married friends appear to be finding life particularly straightforward either. Do yourself a favour, and put this short, clever, relatable but equally heartfelt and honest book about life, choice and women on your summer reading list. And if your bag’s already full, buy a new one. Huge thanks to the marvellous Drew Jerrison for this one. 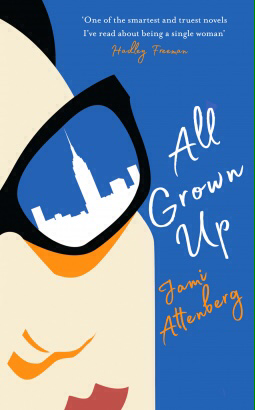 All Grown Up by Jami Attenberg is out now, published by Serpent’s Tail.